The FT Series force tubes feature Exlar's roller screw technology housed in a telescoping tube mechanism. As the screw rotates, the force tube extends and retracts with the follower. The FT Series is compatible with many standard motors, and mounting and gearing configurations are offered for nearly any application. The three standard frame sizes offer strokes from 12 to 96 inches, with loads up to 40,000 lbf. Exlar's roller screw technology results in longer life, higher speeds, and high loads when compared to other technologies, such as ball screw and acme screw actuators. With similar sized actuators under similar conditions, the FT Series is expected to have up to 15 times the working life of other actuator technologies. The sealed housing of the FT Series keeps abrasive and corrosive contaminants from reaching the actuator's internal components, resulting in long, trouble-free operation under severe conditions. Grease lubrication is standard on the FT Series, although provisions for oil-filled lubrication are available. P = Parallel, 1:1 drive Optional 5 digit assigned part number to designate unique PN. Please provide a drawing of motor dimensions with all orders to insure proper mounting compatibility. *Mounting face size, shaft length and other details of particular motors may require special adapters or provisions for mounting. Always discuss your motor selection with Exlar engineering. 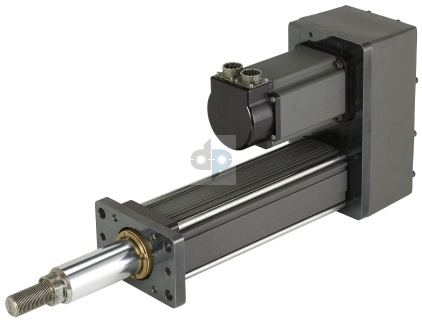 ** This option offers a true zero backlash follower for the FT Series actuator. The dynamic load rating of zero backlash, preloaded screws is 63% of the dynamic load rating of the standard non-preloaded screws. The calculated travel life of a preloaded screw will be 25% of the calculated travel life of the same size and lead of a non-preloaded screw for the same application. Preloaded follower is not available with absolute feedback options.